Baby naming is a big deal these days!! There are entire websites dedicated to picking out names that go with a certain trend or match each other in special ways. Lots of people get flak for making up crazy names or spelling them in a unique way. Celebrities can be a special kind of crazy about names. I'll even admit to being a bit particular about my own children's names. Because I was teaching when all three of my children were born, I made a special effort to stay away from popular names. My reasoning was that I couldn't bear to call out a name all day long and then go home and continue saying it. I got a real winner with Frances. She is named after both of my grandmothers and 10 years later her name is still not showing up on lists. Henry, on the other hand, is a name I am hearing more and more often. I blame Julia Roberts, who named her son Henry 10 days after I did! COPYCAT!! Benjamin is on all the lists. In my defense, I thought he was going to be a she. And the name I had ready is not trending, so I would have been okay with that one. The top two Baby Tigers belong to Henry. The bottom one is Benjamin's. In this case, I would have a little girl named "Little Girl" and two little boys named "Little Boy." That might get a bit confusing, but honestly, I call both of the boys Bubby at times and they seem to figure it out. I mean George Foreman named 5 of his 12 children George (and one Georgette)!! I guess I would have had to go with "Girly" and "Boy-y." That one would be hard on a spelling test, right? Naming a child based on looks is hard. Their adult self looks very different from their newborn self. I would have had three kids named "Baldy!" That wouldn't go over well in the corporate world! Or maybe I could have named them all "Brown Eyes." If I waited till they had gotten some personality, Frances could have been named "Stripes with Plaid!" And this is Bunny Bun. Going off of this theme, I guess the kids would have been named "Girly-Girl" and "Boy-y Boy." Maybe I could even go with "Kiddy-Kid" for a little variety. 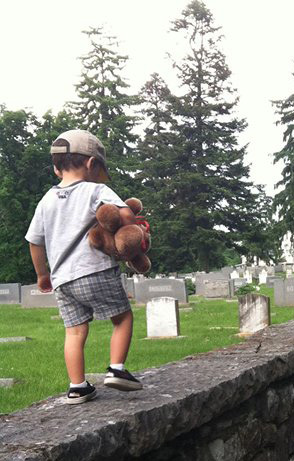 That's Benjamin and his teddy, "Nothin' the Bear"
How about you? What would your kids be named if you based it off of their stuffed animal collection? So true and so funny! My husband and I took care of naming our oldest son's first teddy bear so that one has an actual name: Mr. Poos, after our old neighbor. After that it goes downhill fast! There is Teddy, Puppy, Duck and both of the boys' lovey blankies are called Nonny. That's b/c Aiden, the oldest, mispronounced Nigh Nigh (I'd give him his blanky and say "Nigh Nigh" and snuggle it up against his little cheek.). Great post! So funny and so true! I would have bunny, doggie, monkey, banana, and chuckles. Of course their middle names would be Tigey-wigey, zeebie, bunny ra-ra, turtle, and of course, doggie again. We seem to lack originality over here! Oh, it would get interesting..and repetitive! My daughter has a doll my mom (Nana) gave her and she named it "Baby Nana." My mom was suitably flattered. The rest of the stuffed animals are mainly named after a baby we know, a friend we know, and two dogs we know. So literally everything is "Eliza," "Declan," "Chloe," and "Kelsey." So if they were my kids, I'd get quite confused yelling one name and having four people answer, "Yes?" I have a post in my draft folder about the Sisters' dolls' names, but it never occurred to me to think about naming babies in that same way. Hysterical. Thanks for the extra laugh today- I needed it! Hee hee! We would probably be named something like "human-y" or "Girl-y". Right now my 6yo has two bears named Duffy and Fluffy. So fun! Love the pictures of the stuffed animals. My boys would definitely give them names like froggy, puppy. so I guess all my babies would be called baby :) Visiting from SITS - great to find your blog! I love Unicornia. My daughter calls her little stuffed doggy Ollie, which sounds like he's English. LOL. Visiting from Sat Sit Girls Sharefest. My son had three very similar stuffed bunnies when he was little, named NaNa, BaBa, and LaLa. He got really defensive if we called one by the wrong name! My daughter went through a phase when every doll she owned was named Tiffany. See, I think if they all have the same name it just makes it so much easier on the parents! Thank your daughter on my behalf! How fun. Let's see, based off of my son's "Um Tiger", I could have had "Uh boy" or "Uh Baby". Based off of "Tongue Doggy" (a dog with his tongue hanging out) I could have have "Cry baby". Fun post! Thanks for sharing. Too funny and so true! In my house we have Bear, Bear Bear, Big Bear, Big Bear Bear, Little Bear, Ted, Teddy and Ted E. Bear. and that's just the bears. My husband hasn't mastered the names either. He wanted to rip his hair out trying to locate Bear Bear for a crying kid recently. Oh, your poor husband!! I could never keep track of those! At least all our stuffed tigers are named “baby Tiger.” That’s easy to keep track of! Too funny! My little brother had a toy cow that he called Moo Cow.... so would that make him Talk Boy? Great post, love the thought behind this!